Goldfinches are increasing around Fearnan, and are frequent garden visitors during the winter and spring especially if you provide niger seed in your bird feeders. I catch and ring many in my garden, whenever the wind is calm enough to allow a mist net to be erected. On the 10th April 2014 I caught a Goldfinch bearing a strange ring and reported it to the British Trust for Ornithology, who run the ringing scheme. 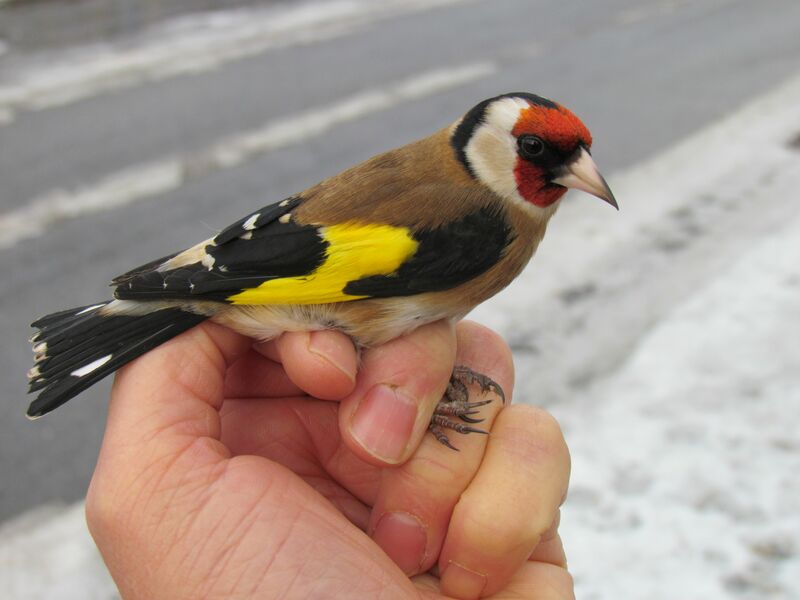 The Goldfinch had been ringed at Perry Court Farm, Kent, on the 20th December 2013 some 682 kms as the goldfinch flies from Fearnan. A fairly typical movement of some birds moving south for the winter months and then returning in the spring. There will be a different type of migration on Saturday evening (21st Feb), as pudding lovers from near and far converge upon the village hall for the annual pudding-fest. It starts at 6pm and lasts until the last pudding has been eaten. There’s live music and all you can eat for £7.00 (school-age children, half price). Tea and coffee provided but Bring Your Own Bottle and glasses.